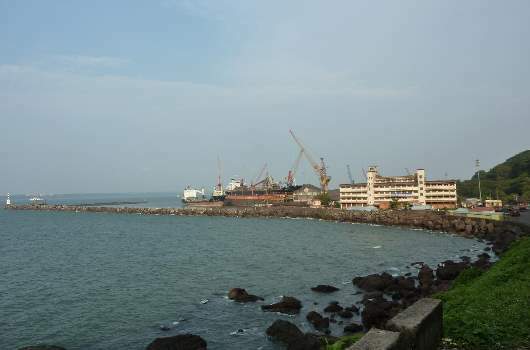 The industrial town of Vasco-da-Gama, named after the Portuguese voyager, lies around 30 kilometers away from the capital city of Panaji and is spread around the base of the peninsula which leads to the Mormugao harbour. At the base of the ruins of Sada fort, there is a small but beautiful beach which can be reached via steps leading down the steep cliff side. The beach remains pretty isolated fro most of the day except for a few locals who venture down for a dip in the sea. There is also a fresh-water spring in the hillside which has a constant flow of water round the year. The main town of Vasco is well laid out pretty much in a straight line along parallel roads interlinked by small bylanes. There is hardly any landmark worth making a visit to Vasco, except for the 400-year old St. Andrews Church which lies at the entrance to the city. In recent times, the city has been attracting local visitors, to what is easily the best cinema theatre in the whole of Goa. The port of Mormugao, around one of India’s few natural harbours, lies 4 kilometers from the city centre and the only airport in the state, the Goa Airport at Dabolim, is also about 4 kms from the city. Vasco also has a railway terminus for passenger trains to nearby areas outside Goa and more importantly a daily service which takes tourists to the magnificent Dudhsagar waterfalls near the state border. There are two beaches near the city. The bigger and the more famous is the Bogmalo beach which is about 8 kms south-east of the town and the smaller one named Hollant lies just about halfway along the same road. Bogmalo beach has luxury and mid-range hotels in the neighbourhood along with quite a few shacks where you can sample some tasty sea-food dishes. Along this same road to the Bogmalo beach is located the Naval Air Museum, the only one of its kind in the whole of Asia. It has on display, some of the fighter aircraft which have done duty for India in its conflicts with the enemy. Vasco-da-Gama is a key shipping centre, very important for the economy of Goa, which has a large number of mines in its interiors. The Mormugao port handles heavy traffic of container vessels and iron ore barges carrying ores and minerals to countries such as Japan and Korea.